Is Housing Still The Best Long-Term Investment Strategy?Is Housing Still The Best Long-Term Investment Strategy? Housing – Is It The Best Long-Term Investment? In some ways, it is understandable why the subprime meltdown took place. Prior to 2006 home prices in the United States in the post World War II era rarely, if ever, declined materially on a sustainable basis. Based on this rearview mirror modeling investors in mortgages were led to believe that default rates would be manageable and if they did default then losses would be negligible because recovery rates would be strong because home prices kept rising. Unfortunately what they did not take into consideration in their models was the impact that their own lending practices had on home prices, the trajectory of them, and how risky the loans were. As a result, home buyers and borrowers who were refinancing their mortgages were being armed with loans that were highly risky because they did not have enough collateral supporting them and the earning power and margin of safety of the borrowers were quite tenuous. 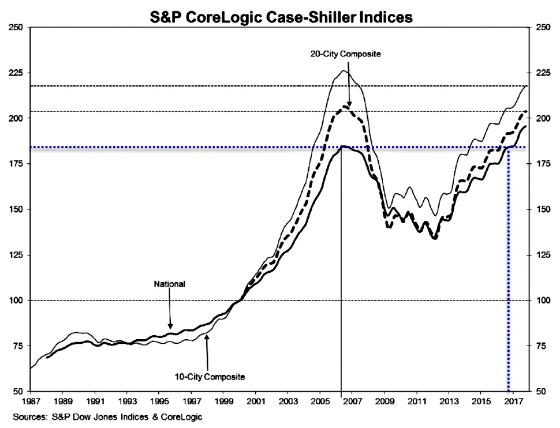 The following graph of the Case-Shiller Indices shows how extreme home prices became, the significant correction that took place, and the upswing that has been in place since 2012, especially in the larger cities comprising the 10-City Composite. My how things have changed. We are now close to recapturing the 2006 highs on a nominal basis. Investors in mortgages have been well rewarded for the risk that they have taken given the very low default rates and the solid underwriting by lenders. Inventory levels are quite low and demand is reasonably high such that it would appear the risk of future defaults is fairly negligible. This is sort of akin to back to the future in that this is how housing had performed for so many years until exotic mortgages and Wall Street created the fake I.D.s to allow those into the party who could not handle their liquor. Housing is, of course, a very localized type of long-term investment that tends to have its own idiosyncratic supply and demand characteristics. Thus, national data does not always accurately capture the returns homeowners generate over the long run. In addition, the quality and consistency of the data has not been very robust in terms of the length of time covered and the lack of long-term, consistent sources. Then there is the leverage that is available, carrying costs, and transaction costs that are not always taken into account to capture the true returns to housing. There are the housing faithful who say that buying a home can be one of the best investments someone can make because of the appreciation potential, leverage, and tax benefits (although this is changing) that can generate compelling rates of return while providing great utility. On the other side of the debate are those who say it is much better to rent to preserve flexibility and to allocate one’s capital away from the costs of purchasing and maintaining a home and putting it into the stock market and other investments that can provide better long-term returns. 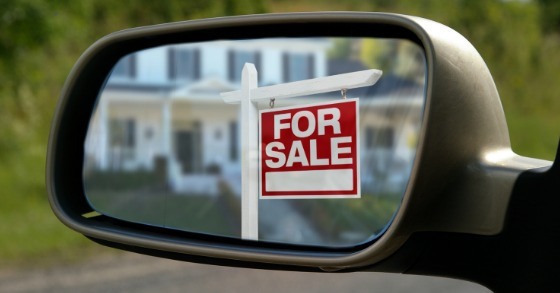 One also saves on very high transaction costs that come with buying and selling homes. So which one is right? Actually, both are to some degree. A group of researchers has made a very credible attempt to quantify the returns to home ownership and compare them to safe assets (Treasuries) and risky assets (stocks) over a very long period of time. 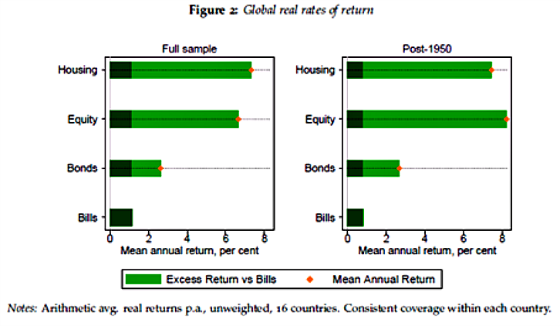 The study is called The Rate of Return on Everything, 1870-2015. 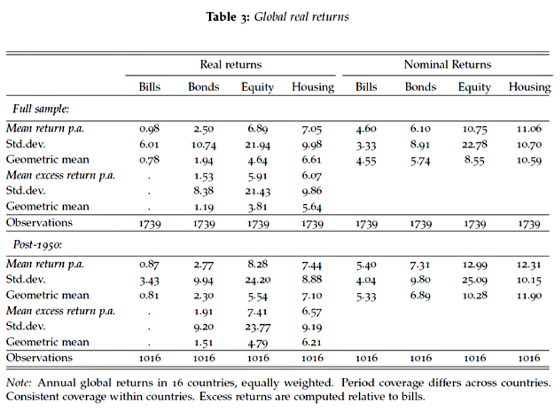 It looks at returns in these three asset classes for 16 advanced economies and draws conclusions that are generally pretty favorable for housing. Before addressing some of the findings I thought it would be interesting to show how investable assets are comprised in some of the largest countries. Surprisingly, the United States is relatively underinvested in housing and makes up for this by having a much heavier allocation to equities. Japan is the most interesting in that it is underinvested in each and overallocated to bonds, cash, and Other non-financial. 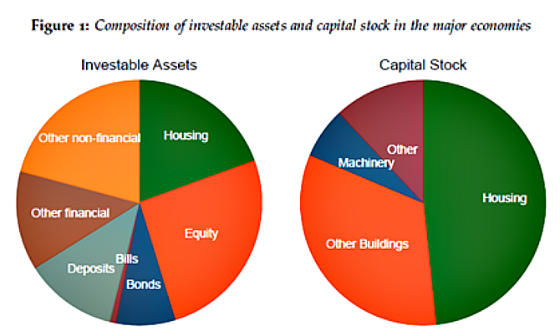 Housing does represent almost half of the capital stock given its very long useful life and continued investment in the asset class. Equities obviously don’t show up as part of the capital stock because they are paper claims on companies assets and earnings. Maybe this has something to do with the authors’ findings. The following table and graphs show the returns for various investments and their standard deviations. Riskier investments are just that. Riskier! These three investment masters realized, unlike academic theory, that risk is a function of whether an asset is mispriced or not and that the volatility is a byproduct of this mispricing versus volatility driving the returns. Real world investment billionaires versus academics. Who would you bet on? I would bet on the former. They have made a great deal of money by finding investments that are perceived to be risky but are priced such that there is a large margin of safety so that if performance is better than expected, which often happens because expectations are so low, then outsized returns can be generated. This is classic value investing. Housing, on the other hand, is probably less like a value stock and more like paying for a call option on the growth of certain areas, barriers to entry in some cases, demographic trends, high utility, a hedge against inflation, tax benefits, and the ability to leverage. The consistency, or lack of volatility, is probably due to homes being in relatively strong hands that lessen the probability of fire sales or major asset class depreciation (with the exception of the subprime meltdown of course). And if there is a fire sale then there will be enough buyers to clear the market without a substantial discount and if there is, the anomaly can be explained away by appraisers so that the rest of the market is not materially impacted. In addition, the illiquidity and high transaction costs tend to lessen the chances of speculation driving property values and resulting in longer ownership periods. All of these factors have probably helped it generate fairly consistent returns over time. There are some other interesting findings in the study that are probably worthy of another blog post. It’s an interesting report that I recommend reading. I will end it here.